Virgil Abloh’s partnership with Nike has resulted in some of the most highly coveted sneakers collabs on the market today, ranging from the Off-White x Air Jordan 1s to his most recent release, the Off-White x Nike Air Max 90. Still, there is much more to come from Virgil and Nike, including a collection of Off-White x Nike Dunk Lows, and an all-new silhouette that Abloh himself debuted at Coachella. 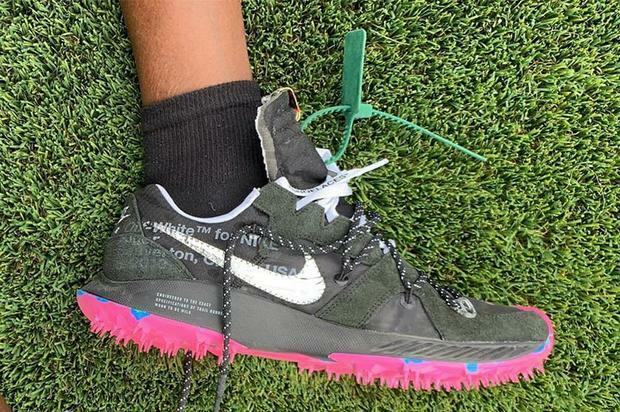 As seen in the early photos that have surfaced, the latest Off-White x Nike collab sports some track and field vibes with a spiky pink outsole beneath the black upper. As always, the kicks feature a deconstructed build with the familiar Off-White detailing throughout, including a zip-tie that comes in green. Take a look at some additional images below, and stay tuned for release details.